Lumunos Blog: Who Would You Be? If you could play any part in the story of Jesus birth, what would it be? I am not talking about donning a striped bathrobe and Burger King crown to be a Wise Man traveling from the east in the Sunday School pageant. I am talking about taking a time machine back, and actually being one of the characters. I would not choose what is called “The Annunciation,” where the angel announces to Mary that she is going to bear a child. That would have scared me to death. Let’s just say that “Let it be with me according to your word” would not have been my response. Wouldn’t want to be Joseph. The agony of feeling betrayed by Mary, then totally confused with what was going on sounds agonizing. Wise Men? Nope—don’t like to travel this time of year. No, I would want to be Mary in the months she spent together with her cousin and friend Elizabeth. Through the brief account of their time together, and my imagination, I see two good friends thrown together in a time of crisis and anticipation. Almost like the bond that develops between friends in the military, or some other type of “war.” They needed one another badly, and trusted each other fully. They shared the experience of pregnancy, but probably each in her own way. 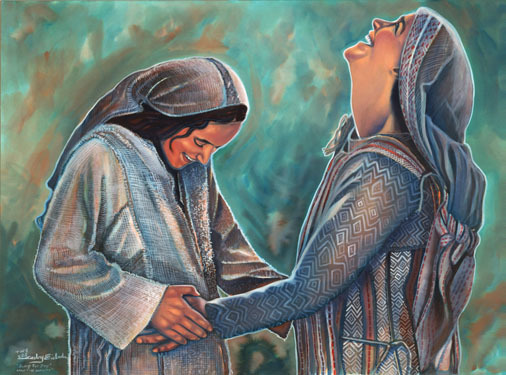 There is no way Mary and Elizabeth could have understood all that was going on, but they had a deep sense that they were a part of something very important happening in the world. All this in a safe place far from the gossip and icy stares of Mary’s friends back home. Waiting is active. Most of us think of waiting as something very passive, a hopeless state determined by events totally out of our hands. The bus is late? You cannot do anything about it, so you have to sit there and just wait. It is not difficult to understand the irritation people feel when somebody says, “Just wait.”’ Words like that seem to push us into passivity. But there is none of this passivity in scripture. Those who are waiting are waiting very actively. They know that what they are waiting for is growing from the ground on which they are standing. That’s the secret. The secret of waiting is the faith that the seed has been planted, that something has begun. Active waiting means to be present fully to the moment, in the conviction that something is happening where you are and that you want to be present to it. A waiting person is someone who is present to the moment, who believes that this moment is the moment. ….A waiting person is a patient person. The word patience means the willingness to stay where we are and live the situation out to the full in the belief that something hidden there will manifest itself to us. That is why I would choose to be Mary in her time with Elizabeth. I want to be that alert, that expectant, that present to what is happening around me. I want to rely on friends, and experience life together. I want to trust that something new is happening in the world, and I have a part to play. And I want to laugh as much as I think Mary and Elizabeth laughed. How about you? Which part of the nativity would you want to experience? And what does it say about what is going on in your life right now? This is a powerful picture from a view I never looked from before. Thank you for a new perspective, and thanks for including that great quote from Henri Nouwen. Great to hear from you. And thanks for the link to your blog on this. I appreciate the connection between unplanned travel and "God with us." Have You Had Your Holiday Meltdown Yet?